Thanks to all who have enquired after what ol’ Rogue has been up to of late, what with the lack of postings throughout the merry month of May. I have been busy doing my usual hound stuff - chasing, sleeping, eating, training Ricky to run. 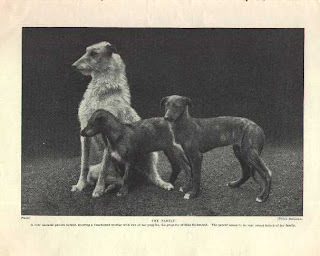 And for the latest posting, I hope you all enjoy the movie below, where Deerhounds take their owners along to be judged at the Scottish Kennel Club Championship Show - usually by another deerhound owner (but sometimes not). It’s dificult to assess how they arrive at the desicions they make whilst judging these humans - perhaps it’s the style of clothing they wear, perhaps it’s the colour of hair or their bone structure - it may even be something as simple as how close they live to the judge or how many of we deerhounds they own - still however the prizes are awarded to these humans you can find the results here. We deerhounds of course, rarely judge each other but simply challenge each other for position in the clan hierarchie. We work together to catch meals and recognise age and weakness and we also enjoy good company. One day we will work out all the human oddities but until then - keep coming back here for more deerhound lifestyle. Would you believe it? Rogues little blog has made cool dogsite of the day, today. Click on this Dogmark link to visit the dogtastic and rather large dog linking website. Dependent on when you read this, we may have already been the dogsite of this day, in which case you will have to visit the archives and select May the 8th from the calendar. Hey! and when the month of may has ended go and vote for Rogues website as site of the month. C’mon the deerhounds! From the 20 year old box of photographs found under the bed, captured in the day when you had to take the film spool to the chemist for processing and prints. Remember then? Here are photographs taken at crufts. Who’s that conversing at the judges table? The diehards should know. More recent history to enjoy! There seems to have been no postings for some time now. Why is that? Well it’s a combination of factors and events here at ‘Rogue Glen’. One factor being the Beltane Fire Festival, an interesting Celtic seasonal event which is celebrated anually on Edinburgh’s Calton Hill. See the images below which are from the event itself. The festival is representative of an ancient ritual that we deerhounds no doubt, once participated in. Interestingly I (literally) unearthed some old Celtic burial information / history featuring deerhound bones and hope to enter the information on a forthcoming blog. To find out more about the Beltane Fire Festival (and I recommend a trip to experience the spectacle and enjoy the thrill if you find yourself in Edinburgh on May 1st of any year) simply follow the link. there are also some nice images in the Gallery and also histories of the Fire festivals, which include: Lughnasadh, Samhuinn and Imbolc as well as Beltane. The next big date, keeping Deerhounds in Scotland busy, was the Scottish Political Elections on May the 4th. Short of when our hunting is affected and / or dog laws are introduced, we deerhounds don’t follow much of the shenanigans and even then, pay little regard to it. If you are intersted in the complex human ways and Scotlands future history - go here for the results. Finally, the major reason for the lack of action on the blog this week was Ricky and I working through a rapid training routine, with myself, Rogue as pace setter (and coach of course) in preperation to run in the Edinburgh BUPA Great Run a 10k circuit of the city (that’s 6.2 miles in old money for the benefit of deerhounds). The event was a team entry of 10 humans, all to complete the 10 kilometres for the 10th anniversary of the design consultancy in which Ricky is involved. All the sponsorship procedes were donated to Edinburgh Sick Kids. 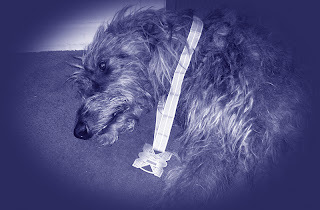 Although the Rogue didn’t get to enter, I like to think it was the deerhound inspired running that helped Ricky complete the 6 miles in under an hour - check the time slip above and the photograph featuring myself in my well deserved medal.